In December Essex & Kent Motorsport were lucky enough to be invited by Hyundai World TCR team to join them in a three day test at Portimao in Portugal with their Hyundai i30N TCR car. Hyundai rented the complete facility at Portimao for two cars from the WTCR team and our car driven by Lewis Kent. With just three cars at such a fantastic venue in the south of Portugal just before Christmas – what more could we as a team ask for! Having never been to this circuit we expected Lewis to feel his way around slowly but on the first day he achieved a best time of 1min 58sec – very promising for the next two days. Hyundai were keeping a close eye on Lewis and on the second day, after looking at our data, came up with some changes we should try on set up, we never expected to compete with the times the World TCR drivers were achieving but by the end of the day Lewis had brought his best time down to 1min 53.35sec just 0.40 sec off of the best time achieved by the works drivers and World touring car champion, a time which would have given him pole position last time TCR raced at Portimao! Considering the limited resources we had compared to the works team we were over the moon with Lewis’s performance and so were Hyundai. Hyundai updated several things on our car during the day and on the third day although we had used the best of the tyres we had with us, Lewis remained on the pace. We came away from Portimao on a high, never expecting the results both Lewis and the team achieved. Armed now with what we had learnt during those 3 days has put us in a terrific position once the TCR UK season starts and both team and driver are confident of improving on 2018 thanks to Hyundai. 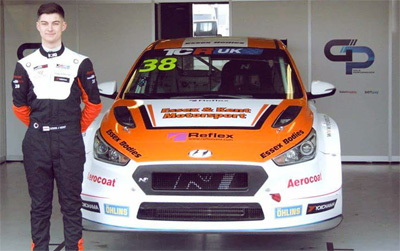 This entry was posted in TCR UK and tagged Essex & Kent Motorsport, Essex And Kent Motorsport, Hyundai, Lewis Kent, Portimao, Portugal, TCR UK, TCR UK Touring Car. Bookmark the permalink.